Dogs have long been used to help people. Seeing eye dogs and mobility dogs to help with wheelchair bound persons are more well known than psychiatric dogs and services for Autistic persons. When prescribed by a a doctor a service dog can accompany a complex child everywhere he goes just as a seeing eye dog is used for a blind person. Billy Ray is on his second service dog though he had a pet who was a big part of his care before we knew of the service dog concept. She assists him by keeping him calm and reducing agitation. Billy Ray and his present dog, Penny Lane, are truly soulmates as you can see by the picture. This picture was snapped one morning when Billy Ray was getting dressed and Penny Lane was napping on his pillows. It must of looked inviting because he crawled in with her and they fell asleep together. I think it shows the bonding and love between the two. Penny Lane enables us to go places we probably wouldn't with his dog. For example, he would become really agitated in long drives but having his dog relaxes him. They usually sleep toward in the backseat. She helps him to get to sleep even if it is in a strange bed. When he is becoming agitated sometimes just bringing his dog to him and having him pet her will be all that is necessary reducing the need for medications to calm him. In the night he had been bouncing and talking for hours. My nerves were getting frayed from the noise and lack of sleep. Eventually Penny Lane came and lay next to him with her head on his tummy. He gently stroked her for half hour or so. It was the most quiet we have had in hours. Thanks Penny Lane!! You can read more about her on my website and there a chapter in Parenting Your Complex Child (AMACOM Books April 2006). You can also get more information on the Delta Society website and Arf Kids. 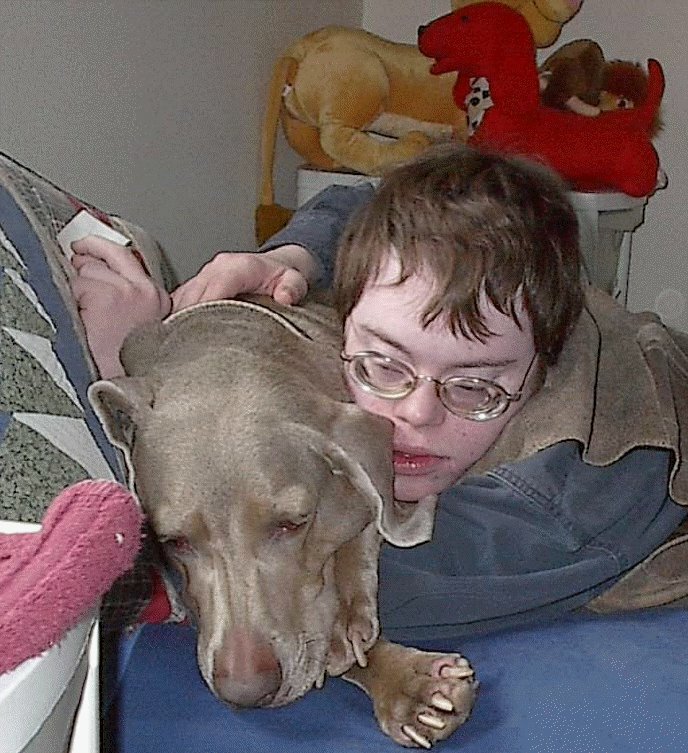 Service dogs are not for every special needs child and his or her family. When it works it is something very beautiful. Griffin has a service dog named Abby, we rescued her from the animal shelter last year and what a perfect service dog she has been. He has just recently started to bond with her and showing affection toward her. Her presence has made such a tremendous difference in our lives because she calms him and keeps him "grounded". I am ever so grateful to our Abby for being so patient, tolerant, and well behaved. I got lucky with her because she is not professionally trained. In Alaska service dogs do not have to be prof. trained so I just trained her myself and she is incredible. my son is lightly autistic and i would like to know how to get a dog and much it costs. also i need to know if there is a grant i can get to help pay for the service.